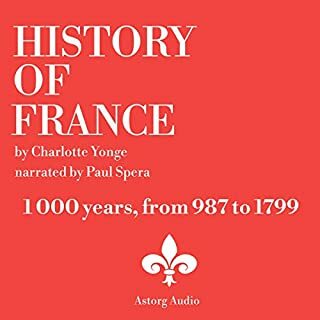 In this audiobook, read by Paul Spera, each historical event is replaced into context and presented in clear and easy-to-read snippets, so that younger and older readers can deepen their understanding of how modern France came to be and broaden their culture. This chapter of France's history is about The Wars Of Religion: the Bourbons and Guises, the Reformation, the conspiracy of Amboise, the regency of Catherine de' Medici, the Religious War, Catherine's Policy, the massacre of St. Bartholomew (1572), the League, Henry IV, the edict of Nantes, Henry's Plans, the States-General of 1614, the siege of Rochelle. Charlotte Mary Yonge was an English novelist and historian. Yonge's work was widely read and respected in the nineteenth century, and admired by many great writers like Lewis Carroll or George Eliot. She attached a lot of importance to the education of girls, and her work reflected the values and concerns of Anglo-Catholicism; she wrote many historical novels, for which she studied history in great detail. 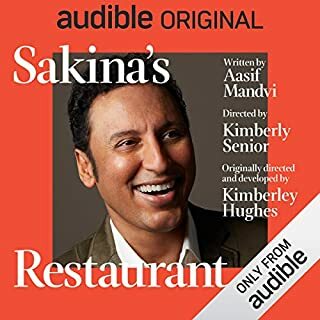 This audiobook, read by Paul Spera, is her retelling of the essential episodes that made France. Each historical event is replaced into context and presented in clear and easy-to-read snippets, so that younger and older readers can deepen their understanding of how modern France came to be and broaden their culture. 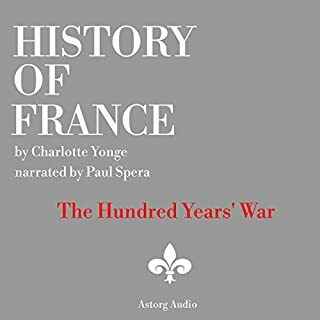 This historical essays deals with France's earlier kings, the hundred years' war, the struggle with Burgundy, the Italian wars, the wars of religion, absolute monarchy, and the French Revolution. way too brief. it skims over everything lightning fast and was over before I realized.